FPIES is an allergic disorder that occurs in approximately 1 in 10,000 children. The main symptom of FPIES is profuse vomiting, which can be accompanied by pallor, floppiness, hypotension and hypothermia. Most affected children have their first reaction before one year of age. FPIES reactions may be triggered by a variety of foods, although the most common triggers in Australia are staple foods such as cow's milk, rice, oats, soy and eggs. 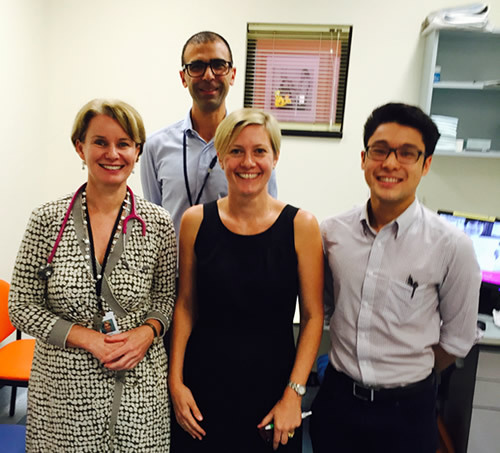 This research team, led by Dr Sam Mehr (pictured above at rear) with from left: Professor Dianne Campbell, Children’s Hospital at Westmead, Dr Katie Frith, Sydney Children's Hospital, Randwick and Eric Lee, medical student. Their aim is to better understand what genes are switched on in an FPIES reaction to improve diagnosis and treatment. They will be looking at tests to predict whether children are still allergic to the food which gave them the FPIES reaction, and how long it takes infants to outgrow their allergy. This is important so that children are not unnecessarily avoiding an important food for a prolonged period of time.